Jan 19 2018 - We welcome the recent agreement between Bangladesh and Myanmar for the repatriation of Rohingya refugees in Bangladesh. However, there is ample ground for scepticism regarding the real concerns of the Rohingyas fully addressed by Myanmar. Now, as the date and timeframe have been fixed, a further concern—the rate of repatriation—has been added. Only since August last year, over six lakh Rohingya refugees have sought shelter in Bangladesh. Another 48,000 are likely to be born in the camps. At the rate that has been proposed, is two years a feasible timeframe to repatriate this huge population? And what of the other major requirements that must be ensured to make the repatriation meaningful? Restoration of citizenship and guarantee of safety once they are repatriated, are concerns that still remain. 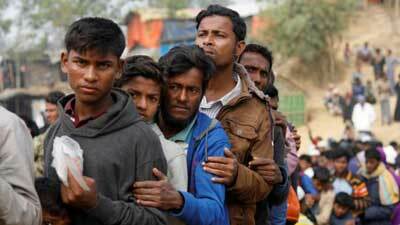 The Myanmar-sanctioned Annan Commission had stressed on both these factors, and as it happens, the plan of first settling the repatriated population in camps in Myanmar has already raised fear among the refugees—the root conditions which caused them to flee have not been addressed. These concerns should be addressed honestly by Myanmar now that the process of repatriation is about to begin. Monitoring of the repatriation is imperative and in that the UN can play a major role. And the rate of repatriation should be increased so that the process can be completed within two years, if not sooner. However, while dealing with the current issue, we should not overlook the fact that there are another nearly 300,000 Rohingya refugees who have been in Bangladesh since 1991, whose repatriation should also be completed as soon as possible.